A complete one pot meal of flavorful Herb Rice soaking-up all flavor of tender Lamb Yogurt Curry. Gluten free. 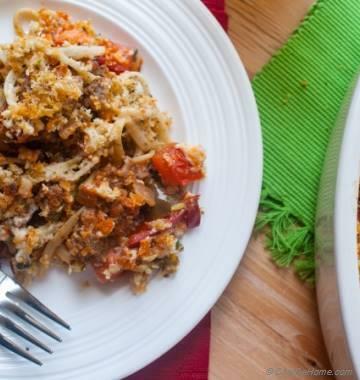 One more Instant Pot fav! This recipe for Lamb Curry is complete one pot meal. Rice are cooked in the yogurt lamb curry gravy soaking-up all flavor. This one simple step makes rice extra scrumptious. Plus the comfort of one-pot meal is simply unbeatable. Gluten free. One more thing is sure, prepared in Instant Pot start to end, this curry will be your favorite and easiest Sunday dinner ever! This recipe is two-in-one. First it is Lamb Curry, then Lamb Curry Rice. So, just in-case you don't want to use rice. 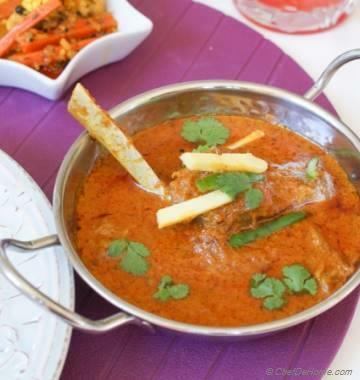 Stop at Step-4 in recipe directions for a pot full of mouth-watering Lamb Curry. In our home, our all weekdays are focused on healthy meals, lite lunches and whole grain breakfast. But weekends are all about comfort food, and family-style elaborate meals. This is also time when I like to do some meal-prep for weekdays. 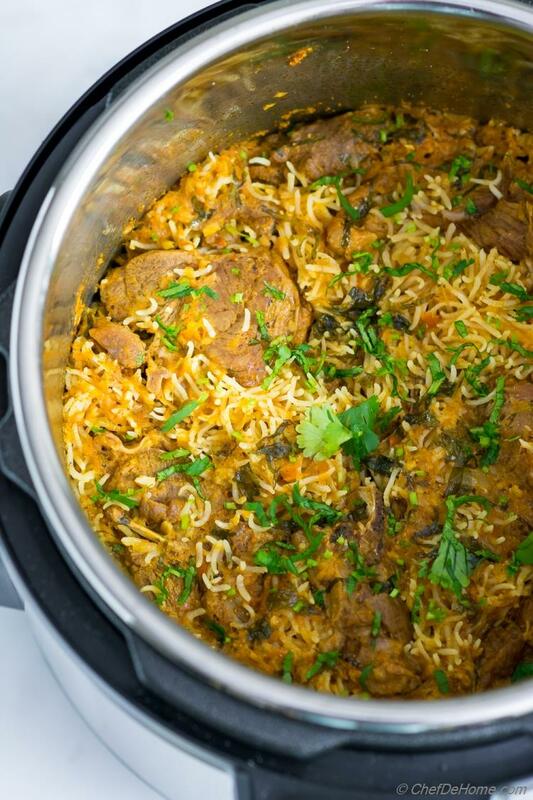 This Instant Pot (Pressure Cooker) Lamb Curry Rice is one such special Sunday meal. I love preparing a pot of Lamb Curry Rice over the weekend. Usually we enjoy it for Sunday dinner. I do make some extra so that one or two portions can be our weekday meals. 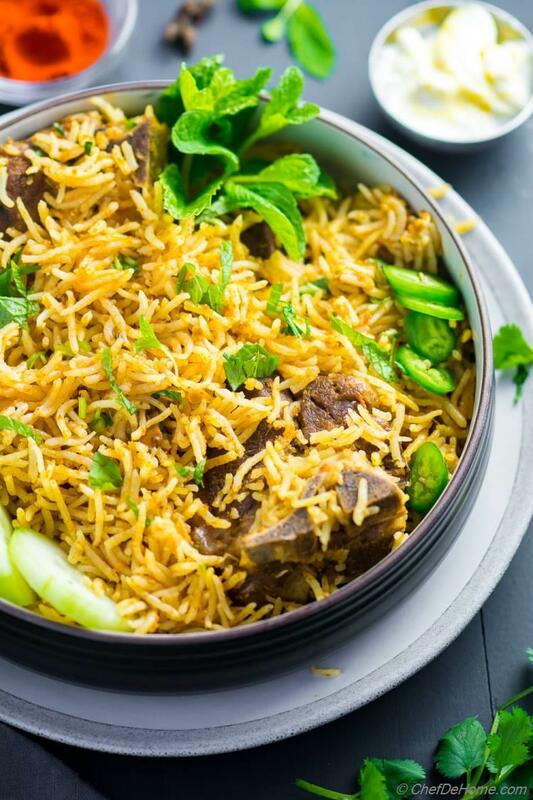 Lamb Rice stay good in refrigerator for 4-5 days. No freezing necessary. Recipe makes 4 hearty servings. 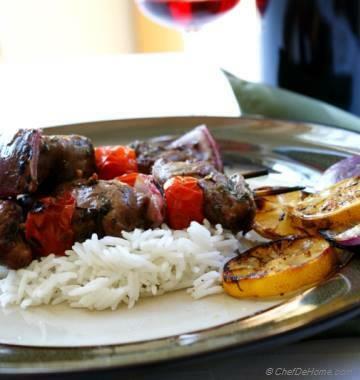 You easily double the amount of meat and rice with some adjustment of base flavors and salt. As long as I can remember, I have seen my mother and even myself cooking meat and rice in nothing other than Pressure Cooker. When lamb is cooked under pressure, it gets bone-apart tender. The flavor it adds to base curry sauce is simply irresistible. I love the fact that Instant Pot has pressure cooker setting which makes this recipe under 30 minutes. Very less dishes to wash and a meal that my family can enjoy 2-3 times a week. Score! Cooking Lamb Curry Rice in Instant Pot is two step process. 1) Lamb Curry: After sauting the aromatics with spices, garlic and tomatoes. The meat is cooked with thick Greek yogurt. Next, I dilute it with water and cook in Instant Pot at High Pressure setting for 15 minutes. During this time, meat gets pull-apart tender, release it's juices and flavor into the curry sauce and also picks up flavor from spices and yogurt. 2) Cook Rice in Curry: Second step comes in when planning to serve lamb rice. I add washed long-grain white rice into the pot with some salt, and chopped mint. 5 minutes at high pressure and lamb-rice are ready to serve. Like I mentioned, rice literally cook in curry sauce. Pick up all flavor from sauce: the tang of yogurt and lime juice, spices, hearty cooked lamb flavor! OMG! I can tell you these rice are rich, tasty with tons of flavor. Good Question. 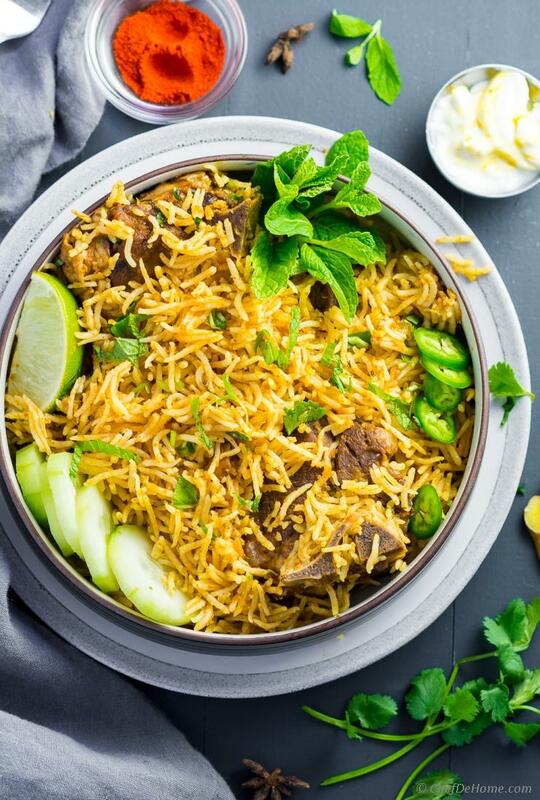 Lamb Biryani is an elaborate way of cooking lamb and rice in one pot with layers of cooked lamb, rice, nuts and herbs. 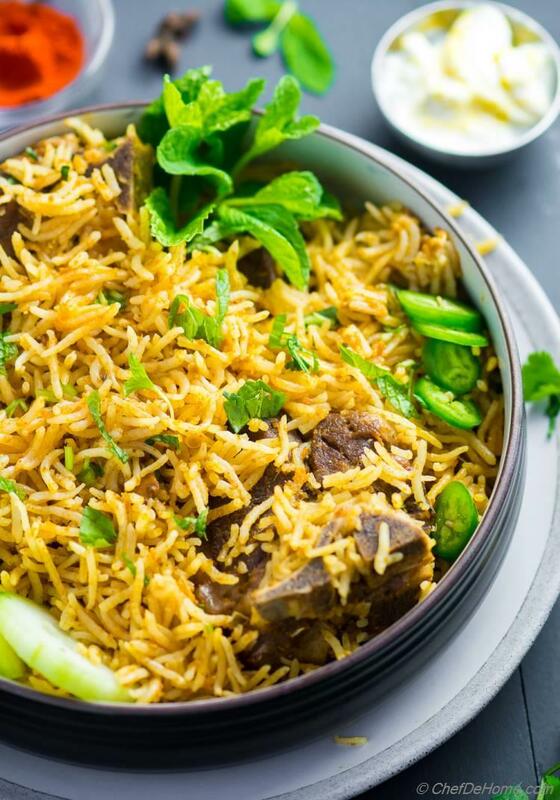 In some households, lamb biryani is prepared as single layer of lamb topped with rice, then cooked low and slow. This recipe has flavor and approach of second method. 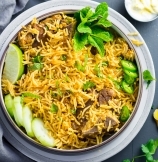 In simple words, it is an everyday, easy, restaurant-style Lamb Biryani. Serve with side of saffron yogurt, and garnish with fried shallots, fried cashew nuts for more traditional flavor. How to cook without Pressure Cooker? Recipe can be easily converted to cook in regular heavy bottom pot such as dutch oven. Don't change anything but add 1 cup more water when cooking lamb curry. Under pressure lamb cooks very fast but in dutch oven it will take longer to cook. This means it will need more liquid to keep cooking until lamb is done. Once lamb is one, add rice and more liquid. To cook 1.5 cup of rice, you will need 3 cups of liquid. Today's recipe is certainly a glimpse of our Sunday family meal. Also, a great make-ahead-winter-meal to prepare in Instant Pot. I hope you will get chance to cook it soon. 1. In a wide bowl, add lamb pieces with lime juice, 1 tsp oil, salt, and 1 tsp chili powder. Toss to coat well. Set aside. Wash rice under running water, drain and set aside. 2. Heat a tablespoon oil in pot (Set instant pot to saute setting.) Add oil. When oil is hot, add mix of shallot, garlic, ginger, chili and cilantro). Cook for 4-5 minutes or until mixture is slightly brown. If stars browning the bottom towards the end add 1 tsp water. 3. Add grate tomatoes, 1/2 tsp salt. Continue saute until oil shows on side (3-4 minutes). Then add all whole and ground spices. Saute for 1 minute. Add yogurt and mix in. Add lamb and mix in. Add 1.5 cups of water with 1/2 tsp salt. Place lid of Instant Pot. Reset instant pot to cook Manual => High Pressure => 15 minutes. 4. After timer is up, quick release Instant Pot pressure. Open lid. 5. Add rice, mint. Mix well with sauce. Taste sauce. Add salt (if needed) ( I end-up with 1/2 tsp more salt to get correct seasoning in rice.) Replace Instant Pot lid. Cook Manual => High Pressure => 5 minutes. 6. Quick release Instant Pot pressure. Garnish with chopped cilantro. Ladle to bowls and serve hot. Enjoy. I recently purchased an insta pot and love the fact that you offer recipes using it. I also like to grind my own spices. In this recipe you use curry powder. Do you have a curry powder recipe that I could grind up? Hi Mark, thanks for catching the typo. It is mace blade. I hope you enjoy lamb rice. It has been so regular in my kitchen this year that I’m certain you will. I hope to see your feedback. Thanks. In step 2 there are instructions to add ginger - but there is no ginger listed in the ingredients list. How much ginger should be used? Hi Nora, thanks for pointing out. I added the ginger. You will need about an half inch piece of ginger. I hope it helps. All your ideas & fusion of recipes are awesome. Sylvia, thanks. I'm glad you like my recipes.